What's your favorite Wacky Pack? Hostage Cupcakes? Busted Finger Candy Bars? Slaytex Living Gloves? 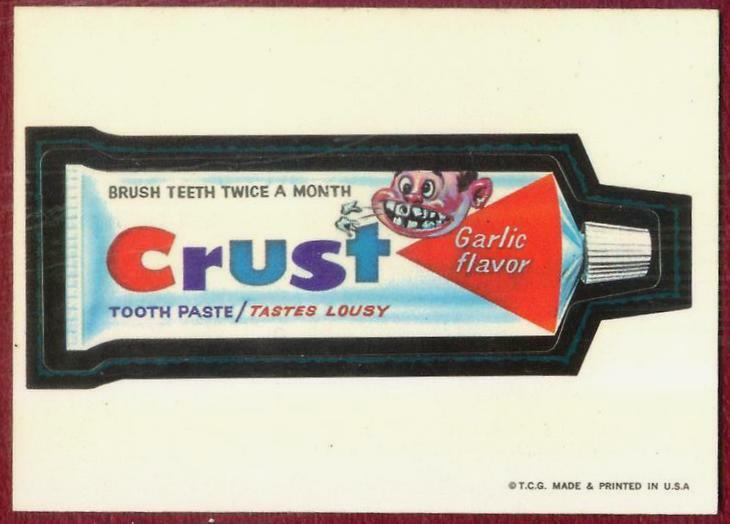 I think Crust Toothpaste, an oldie but a goodie, is mine. I love that this site is offering a "stocking stuffer" -- 60 packs for $27.50! That would occupy my whole Christmas day right there, just opening and reading them, and then sorting and trading. Uh, what do you mean I'm not nine anymore? I'm all about the Hawaiian Punks. My uncut sheet of Wacky Pack stickers is now hanging over my kids wall - he claimed it when we moved to where we are now. My favorite is the Big Muc! I don't know if it was in the original set. I bought a bunch of the newer releases (06?). And it was a magnet card. The magnets were randomly inserted chase cards. Second place has to go to Cherry Croak.